Amazon has released a really cool new application for Windows computers called Send to Kindle that allows Kindle users to easily upload and send personal documents and non-Amazon ebooks to Kindle devices, Kindle apps, and Amazon’s cloud from a personal computer. Send to Kindle stores your personal documents and ebooks to your Kindle account for storage and future retrieval. They get synced and backed up and are available for download anytime. You can even select to send the documents and not have them added to your Kindle library. Basically it’s like using the Kindle email service but without the emails. The app makes the process faster and a lot easier. It works like this: Download and install the Send to Kindle app (it works with Windows or Mac). After signing in with your Amazon account, just right-click a document or multiple documents and click Send to Kindle, which brings up the window shown below with several options. 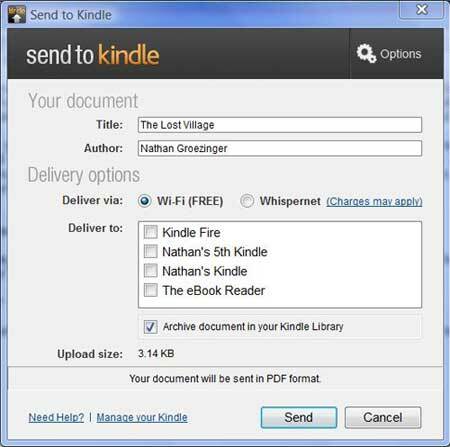 You can select which Kindle devices you want to send the document to, and choose to deliver it for free over Wi-Fi or pay to deliver it over Whispernet when applicable. You can change the name and author of the document/ebook, and choose whether or not to upload it to your Kindle library. At present, the only Kindle apps that support having personal documents sent are the iPad and iPhone apps. The Send to Kindle help page at Amazon lists the supported formats but it forgets to include DRM-free .prc and .mobi. I tried, and both worked, so I added them to the list. In addition to right-clicking documents to send them, you can also select “Print” from any Windows application that supports printing, and then select “Send to Kindle”. These get sent in PDF format. We need this for Mac! But we can simply drag & drop pdf documents directly from our computers into the kindle reader. There’s no need to email – or use this app. True. But if you use the drag and drop method they aren’t backed up in Amazon’s cloud and aren’t accessible for download and don’t have Whispernet syncing for last page read, notes, and highlights across other Kindle devices and Kindle apps. So far I have found Calibre adequate for getting any content, such as from the Gutenberg Project, from the web to my Kindle. “I have found Calibre adequate!”, um, yeah… Calibre is an application that you have to run, then select settings to convert the document, THEN you STILL have to move the converted document to your Kindle. “We can simply drag & drop!” um, yeah again – you have to attach your Kindle via the USB cable to drag & drop (how convenient!) -AND- you can only drag & drop Kindle “recognized file types” (a very small list). This app is EXTREMELY convenient (it isn’t even really an application in the sense that it needs to be “run). It simply integrates seamlessly into your computer’s file system so that a simple right-click menu selection is all you need to transfer most popular file types to your Kindle instantly (if necessary, it converts them for you on the way). PLUS, this app essentially gives you a direct-to-Kindle PRINTER… anything you would normally wish to print: online order confirmations, receipts, articles, web pages, images, notes, etc. – you can “print” directly to your Kindle using the File>Print menu available in virtually every application. This app (more like an extension really) is one-click convenient, offering you two very simple methods to send almost any content you wish from computer to Kindle. HIGHLY RECOMMENDED.